We talk with an ecologist and environmental consultant, about how he uses the ALA to inform environmental impact assessments and offset planning for development projects. Dave Maynard, Principal Ecologist, NGH Environmental, in his ‘office’ on the Central Tablelands of New South Wales with the threatened Eucalyptus pulverulenta (Silver-leafed Mountain Gum). 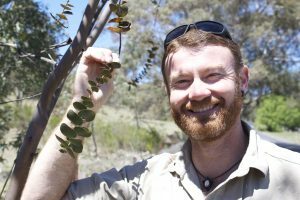 Dave Maynard, Principal Ecologist with NGH Environmental works primarily on assessing the impacts of developments on threatened species and communities and provides guidance on how to avoid or minimise these impacts. He specialises in flora and fauna assessment and has led numerous surveys within several biogeographic areas of NSW including the south-east coast, southern and northern tablelands, western slopes, alpine areas and the north-western plains. Dave is keen to acknowledge the ALA is an important tool in his line of work. “The first step in any environmental impact study is a desktop assessment – even prior to a field survey – to first gain an understanding of what threatened species are likely to be in the area, and their distribution. The ALA is a great tool for this,” he said. Dave plans and implements a range of ecological projects including flora and fauna surveys, constraint analysis, biodiversity impact assessment, offset planning and environmental management for private development projects, including solar and wind farm projects. 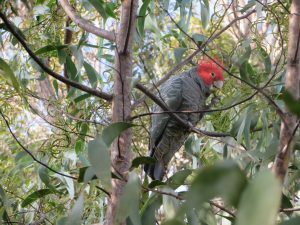 For projects in NSW, Dave consults official records held by the NSW Office and Heritage through BioNet, and supplements this information with records in the ALA.
Gang-Gang Cockatoo (Callocephalon fimbriatum) on the south coast of New South Wales. The environmental consultancy work that Dave carries out focuses on protecting the habitats of threatened species wherever possible. “The information on species location and distribution accessible through the ALA informs our assessments and this results in private developers avoiding, minimising or managing impacts on the habitats for the species identified,” said Dave. To find out which species occur in a defined area such as a National Park, or state or territory, you can download an area report from the ALA’s Spatial Portal. To find out how, follow this link: How to generate an Area Report.